ANZAC Day has come and gone for another year. The media greeted with the old tired stories – Who is making the poppies? Record numbers attend celebrations (assertion rather than evidence). Young people attracted increasingly (assertion rather than evidence). The stories they miss might well have headlines such as “Migrant citizens support ANZAC Day in swelling numbers” for that seems very much to be the case in Auckland, “More people are wearing medals they didn’t earn than those who did”. It is this last potential headline that worries me because it will be true one year soon. The numbers of service men and women who saw active service is dwindling. Wheelchairs and a slow amble replace the brisk march in time and with precision that former service men and women could muster back in the 1970s. Back then I played in a military band and it was our task to provide the musical lead for those returned from the South African War (The Boer War). The numbers dwindled as time caught up with them. Now the same is true of the Second World War returned soldiers. One day hopefully there will be no new returned servicemen to swell their ranks as those from the Korean and Vietnam conflicts become fewer in number. A corollary of this is the increasing practice of descendants wearing the medals of their forebears who gained them through service, distinction and bravery. Now this is allowed for on 25 April and 11 November (but I do wish that people could honour the requirement that they be worn on the right hand side) but when this becomes the norm rather than the exception, ANZAC Day would become something else. It would be a good thing if we addressed the question of what ANZAC Day might look like in 20 years time. The celebration of wars (and that has always been selective) and those who served cannot sustain such a day forever. I have argued before that ANZAC Day should become a celebration of the nation as a nation – a true National Day. Waitangi Day is about one element of those defining characteristics that make New Zealand what it is, but there might well be a cluster of values that become an ANZAC Code or Charter that receives special attention on and around ANZAC Day. The third leg of the celebration trifecta would be Remembrance Day (11 November) which would retain a single focus on military service and bravery, it’s another day that deserves to be looked at and elevated in prominence. our special relationship with Australia and directions in which it might develop. New Zealand will inevitably relate to Australia in a changed way over time. Political alliance will reflect the developing family, social, sporting and business alliances that bring us closer together all the time. We should stop from time to time to reflect on this critical relationship and in so doing seek ways of putting the spirit of ANZAC back into 25 April. Education could well pay attention to developing an education “common market” across the two countries – I believe that the benefits will largely accrue to NZ in such a development. a focus on the diverse cultures of the community which would complement our focus on the founding bicultural relationship with Maori that characterises Waitangi Day. There currently are festivals but to celebrations of difference and distinction together emphasises the qualities of diversity. The individual celebrations would of course continue at times that relate to the appropriate times in countries of origin. the special connection between people in New Zealand and the environment. This area is one of high and critical social and economic value – do we stop to reflect on it other than in the context of issues, scraps and disputes. What happened to Arbour Day? the value we place of sport and outdoor activity. Sport is already operating effectively across ANZAC boundaries. Now the focus could be on getting families out onto the grass – shut the shops for the day and let the people play! the role of the arts in the community. This might have a special emphasis on reaching new audiences and highlighting opportunity. the role of courage, honesty and integrity in New Zealand. Somewhere the ANZAC Charter will need to address values which around ANZAC Day school children might reflect on. This country was established many hundreds oif years ago and developed ever since because of people with courage. It was also defended in conflicts by people of great courage. Now that we are the third generation bought up in peace, courage needs to be explicitly developed and discussed. An old argument about ANZAC Day was that the ceremonies and suchlike would prevent countries going to war – perhaps the emphasis in a reinvented ANZAC Day would serve to get us back to strong adherence to the values of honesty and integrity. This is not anything other than a starting list of ideas. Many more will occur to you. ANZAC Day will need, somewhere ahead of us, to gain a new purpose and place in our country. There would be a robust debate over perhaps a number of years about this. The world has changed and will change more. Back when I was in secondary school, we used to parade in our school cadet uniform on ANZAC Day, marching through the town to the cenotaph. One year I was sick and couldn’t do this and in fact missed a Latin exam on the next day as well. The Latin Teacher, a Major from the war was highly critical of my missing the exam and suggested that my sickness was a sham. But he saved his biggest dressing down for my having missed the ANZAC Day parade. If he could have sent me to a court martial, he would have. Instead he was content to estimate a low aegrotat mark in Latin. Back from China with a revived belief that the truth is usually in the middle when it comes to issues both within those that are educational and those that are not. So it was pleasing to see that Catherine Issac who is leading the development of the “charter schools” is taking a moderate stance on some of the issues. She senses that the name “charter school” is not quite resonating in New Zealand. She’s not right nor do some of the elements implied by it. She wonders whether the development should proceed only in low decile communities as they would then be in a “goldfish bowl”. They are already for a variety of reasons and it would be simply intolerable, unjustifiable and without honour to introduce charter schools into New Zealand for any reason other than addressing educational achievement. This development is going nowhere it simply sets out to provide an alternative style of school for students who might already achieve. We need people prepared to do the hard yards in lifting educational achievement, to help in communities where the task is the most arduous. The government should ensure that this development is precisely targeted at this. As for the suggestion that the development should be in the hands of “not-for-profit” entities is well and good but the reasons are less so. “Schools cannot be run like a business” she is reported as saying. In many ways they already are. And the suggestion that these schools will be licensed to charge fees (euphemistically called “donations”) beg the question of whether they are to be state or independent entities. Finally, the bottom line of the business of schooling is one which is based on sound business results (not-for-profit does not equate with “for loss”) and sound educational results – these should be the drivers of any charter school style development. Two other issues are from the perspective gained in the east requiring of a little “truth in the middle” treatment. There were questions raised by various people I met in China in general discussions (and I believe also in some of the formal discussions) about the ambivalent attitude towards international investment in New Zealand seemingly signalled by the general response to the purchase of the Crafer Farms by business interests in China. I simply want to say that China is a country that understands international investment both out of the country and into it. Many of the Economic Zones of Development I have visited over the past few years in China are based on overseas investment. But, it is almost without exception achieved through joint ventures. A company from the US wishes to enter China through such a zone. They are welcomed and immediately a joint venture is established. In New Zealand we have a business interest from China wishing to enter dairy farming in a significant way being opposed by a New Zealand syndicate that wants to do likewise. How refreshing it would be to see both working together. The competitive way is a return to the 1980s which is of course where so many New Zealand business people cut their teeth. And the response generally of the community to international investment from China is simply seen as at best unfriendly and at worst as hostile. There can only be one loser in this. These issues can be solved only by seeking the truth in the middle. Finally, I return to a country well-exercised by the issue of problem gambling. It cannot be the issue of problem gambling pure and simple that is causing this although like problem-smoking and problem-drinking and problem-drug-taking it is a huge and destructive issue. New Zealand has big issues with these big addictions. The issue seems to be the connection of problem-gambling with a casino. But I see in the coverage of the issue, no attempt to quantify the contribution of a casino to this and certainly no commentary on the contribution to problem-gambling of the majority of gambling machines which are not in a casino but liberally dotted through community drinking houses, sports clubs, bars and so on. All these machines seek their justification in their return to the community through for one set the contributions to worthy charities and through another by the provision of a major conference facility of undoubted benefit. Like the proliferation of booze outlets, the proliferation of gambling outlets must play a role in helping unfortunates first develop the addiction and then sustain it at much price and pain to those around them. But how much closer do these current discussions take us to addressing the real issue. Not everyone becomes a rabid gambler through playing a machine, nor an out-of-control drinker though an occasional drink, nor addicted to smoking through an odd cigarette (although that one does seem to be the most gripping addiction). The truth is in the middle. New Zealand was once considered to be a country of moderation – moderation in all things was something of a motto. We seem no longer to find that attractive in our gambling, our smoking and our drinking and in our consideration of such issues. Now if we were addicted to educational success I would be thrilled – there should be no moderation in this. To get from Ningbo to Shanghai by road used to take 5-6 hours by road – now you can do it in three hours because they have built a 35 kilometre bridge across the sea of the Yangtze Delta. Why do we struggle with the issue of getting across the narrow Auckland Harbour? Each of the five cities the delegation has visited is building or extending an underground subway system. This is being achieved with seemingly little disruption to traffic (which it must be admitted is a little chaotic at its best). We drive past many schools and frequently see what appears to be the entire school doing physical exercises. This seems to be greatly valued. So too is walking to school. If children can walk to school in the cities of China why is it so impossible for children in New Zealand? It appears that many schools provide school lunches. In one of the provinces this week a group of students became ill after eating the lunches at a school. Both principals of the school were, it was reported, “immediately dismissed”. That is one form of accountability. Despite all this, the cars appear to continue to work, the buildings often display incredible quality of finishing, infrastructure is built at an amazing rate often to spectacular designs, chefs prepare meals, telephones work, fast broadband is widely available in the cities and so on. This area is for me a Chinese puzzle. China reports a growing concern at the unemployment rates among degree graduates. In light of the previous snapshot, you have to wonder if direction is a little askew. Then you remember that the opening up of China sees increasing influence of western patterns and systems and the imbalance between degree qualifications and technician / technical qualifications features in each of the western systems that China is increasingly influenced by. Could it be that the West is exporting its educational mistakes to the East? The importance of major events has been rammed home through regular mention of the importance of the Olympic Games to Beijing, the Asia Games to Guangzhou, the World Expo to Shanghai and so on. The impact of these events seems not to be based on the sort of spurious economic impact stuff that we are asked to accept but rather on the improvement to infrastructure and facilities that is the legacy. But as I head towards home I am reflecting on the advantages of a lack of scale – we do have special opportunities in New Zealand to get it right because we are so small. We need to grasp this as an opportunity and not use it as an excuse for inaction or as a justification. I am just starting week 2 of a trade delegation visit to China led by the Mayor of Auckland, Len Brown. A number of sectors are involved – business, infrastructure, film and the creative industries, tourism and education. The education group reflects the major tertiary providers in Auckland. There remains high interest in China still with education but again I am struck by the phenomenal growth at the tertiary level. Guangzhou and Ningbo have both rehoused universities into precincts of astonishing proportions. In Guangzhou an entirely new university town the size of Palmerston North has been created within the city. Brilliantly designed, beautifully landscaped, artistically enhanced by major public art and sculptures, by lakes and beautiful trees, by contour and perspectives. There are no half measures in these developments. It all reflects a level of sophistication that one would expect in a country with a long history of scholarship and formal education. But there are changes – graduate unemployment is starting to become an issue, skill shortages in the middle levels are appearing and still the contrasts between the vibrant high growth east coast of China and the rest of the country are marked. But I am possessed with a more fundamental question. In a country in which development of both buildings and infrastructure is in your face at every turn I am led to ask: Who trains all the skilled people required to keep this amazing show on the road? I stay in hotels where the toilets work and the taps run, the lights go on and the services are delivered. I travel along roads and motorways, over bridges including the second longest bridge in the world. I eat fine food. All of these require skilled plumbers, road builders, electricians, hospitality staff, catering people and so on. There is in China a vast number of skilled people doing all these things, working in the trades and getting it right. Why then, I am led to ask, do countries like Australia and New Zealand focus so strongly on the degree market and by comparison ignore the skilled trades area – the skilled middle level qualifications that supply the technical skill needed to run the wires, build a road, pour the concrete and generally do the bidding of the “degreed” people sitting in their offices. Both New Zealand and Australia have excellent trades training systems, different but each in their own way excellent. And the tradespeople that come out of this system are excellent in world terms. Why do we not see activity from these countries tackling more aggressively the training in skill areas, in the trades? We do not actually value trades training to the same extent as we do degree training. When I speak with Chinese educators about this they tell me that it is still a dream for a one-child family that that boy or girl will have a prestigious job, have a degree and generally have a role in the emergent new economies of China. Have we heard such arguments in New Zealand? A failed attempt to get into a degree programme can be more attractive than a successful track through to technical qualifications and we do little to persuade the community otherwise. But there could well be other drivers that distract education providers in the quest for the international student dollar. We perceive that there is more money to be made in degree education and on the face of it this might be right if unit price is taken into account but probably not if potential volume is considered. The need to feed the postgraduate money-go-round is an additional likely factor. Finally, we probably are distracted into a belief that there is not the demand simply because our own domestic markets have been somewhat persuaded away from such training over the past three or four decades. The domestic “degrees-for-all” cry has impacted badly on international activity of postsecondary providers. So we could consider in my view the possibility of mounting an international campaign for trades training and getting a series of “trades talk” under way. Taking substantial numbers of international students into trade’s programmes in New Zealand would be excellent in increasing the volume of students in such activity and this could be of benefit to domestic students through increasing the availability and provision of trades programmes. The increased volume of training would benefit both the international students and New Zealand. Where does China get its trades people from then? Well, and this repeats the pattern of successful education systems in other parts of the world but less so the English-speaking systems, at about the age of 15 years, students have choices of differentiated secondary schooling. Some go down academic tracks, some go into trades programmes. Understanding how to articulate with this approach is the next challenge to face the western international education market. For some time I have listed the level of truancy in New Zealand schools as being 30,000 students truanting every day. I knew this to be true even though such a revelation would be often greeted with incredulity. But it is official now! The weekend paper screams its headline “WAGGING SCHOOL THE DAILY DEAL FOR 29,000”. This is an official 10% of the New Zealand school roll. Or as the paper put it, the equivalent of the population of Blenheim fails to go to school each day! How did we achieve the fall of 1,000 between the older figure of 30k and the latest result, 29k? Well it appears that $4million dollars was paid out over the past two years to tackle the issue and the figures have dropped by about one thousand, a 3% reduction for $4 million! Or put another way – for $4,000 we can get one truant back to school. So if we put up another $116 million, could we lick the problem of truancy? I think not. I wonder if it occurs to anyone that truancy is but a symptom of an education system that is simply not working. To think that the answers lie in the schools is about as silly and thinking that the answer to alcoholism will be found inside a pub. Schools as they are currently constituted have never catered for a diverse population over a thirteen year time span. The comprehensive nature of the schools as they have developed compounds the issue, keeping students in school long past the point at which they are learning exacerbates it and throwing money and trying to get “truants” back into the school is, without significant changes, simply wasted. The reasons given by students for being truant as reported make for grim reading. They were “hungover” and “stoned”. School was “boring” “dumb” and they were “bored”. This is so depressing but only slightly less so than the description of this group by a school leader – “Children are staying home to look after siblings or do housework and other activities in the home.” Baking scones and doing needlework as well perhaps. Get real! We have a growing crisis in New Zealand with our young people. We mope around grizzling about youth unemployment when the fact is that we have a bigger problem with unemployable youth. The group that truants is the group that become NEETs, the group that feeds the youth justice system, the group that forever and a day will be a drag on the wealth of the community and the country and its citizens. I cannot accept the Minister’s seeing the solution as being predominantly in the community. True, the community has to play its part, generally the 90% of students who do not truant reflect that the community is doing just that and I meet parents of some of the other 10% who wish for nothing more than that their sons and daughters would want to go to school. where schools demonstrate an interest in all students and give them a vested interest in engaging with the school programme. There is too much failure in primary schools and too great a lack of purpose in secondary schools for our education system to be free of truancy. How long will we continue to be spectators of the trends without heeding what they are telling us? Pathways-ED: Why is “jobs” a dirty word? I cannot understand why there seems to be reluctance and even resistance to the idea that a critical outcome of education is to get a job. Note that I have said “a critical outcome” and made no claim that it is the only outcome. But I must say that without the capability of getting a job after 10, 12, and 13 perhaps even 20 years of formal education all other outcomes are made to look rather meaningless and trite. When I went to school, (yes, this usually breaks out a chorus of simulated violin playing, shouts of “he’ll tell us about walking to school barefoot in the snow into the teeth of a raging gale next” and many other kinds of loving derision) we knew why – it was to get a job. Indeed at the age of 12, I was enrolled in a technical secondary school to become a carpenter. The course of my life was fixed on that job or so I thought. It is a whole other story, intervention by well-meaning educators who classed me as “academic” and despatched me into 10 years of academic learning, the most perplexing years of my life when I most flirted with failure. The removal of the goal of a clear job for a future shaped rather amorphously which only later crystallised into teaching as a job, certainly made my pathway rockier than it needed to be. Take the espoused goal of creating a lifelong learner. I’ll show you a lifelong learner when a person has demonstrated that they are – it is not a soft prediction that one makes. Many seemingly self-educated people are not lifelong learners. To say “I am a lifelong learner” can only be the conclusion drawn after looking back on at least a chunk of a life and being able to document clearly the evidence. You see, what we need from educational experiences is the capability to do whatever is asked of us next. That is why I am frustrated by the unwillingness of education systems to accept that the key purpose of each stage of formal education is to prepare students for the next stage of their lives – education, eventually being a responsible adult, and, yes, finally getting a job. Then there is the nonsense that we are in the business of preparing people to have “at least seven careers” as I read somewhere last week. This is baloney. Rare people have two careers perhaps but most, if they have a career at all, have one. “Career” is a qualitative judgment about a continuous quality of achievement in an area of employment. It might mean that a person has different jobs; indeed it is probably essential that they do, but they are changes and growth within a field not a succession of wild swings between “careers”. Education would do well to set as a key goal, the aim of getting each and every student into a job. Yes there are issues of unemployment but remember that the creation of unemployment is the outcome of a deliberate ideological stance about how economies best run. We could have full employment if we so wished and were prepared to pay for it and perhaps the western world will return to that one day. Who knows?. Or could we return? Alongside the issue of youth unemployment we have another mammoth in the house, the unemployable youth. The skills of employment are not hard to define and one list is about as good as another. Reliability, punctuality, pride in work, ability to work unsupervised, knowing what productivity means, ability to learn, enthusiasm all occur to me. A better, much more worthy, can be seen at http://www.quintcareers.com/job_skills_values.html . These should be a given if an education system is half good. But too often students have simply not acquired them. This is not simply the fault of the system or those who teach but we should ask questions about why this simple catalogue of dispositions and skills evades so many learners. And the answer is clearly, because they cannot see a connection between what they are doing and the life of working in a job or jobs. Unemployment is a scourge of that we can be certain. The wonderful and gruesome and dispiriting TV series, Boys from the Blackstuff, a British television drama series from the early 1980s sticks in the mind for its main character Yosser Hughes who was somewhat demented by not having a job and the devastation that brought into his life. He had a couple of catchphrases, “Gizza’ job!” and “I can do that!” which summed up the continual torture of unemployment. Of course the 1980s a time of serious unemployment among adults who lost their jobs. Now the issues seems increasingly to be among the young who have never had jobs. Can education hold its head up high and say that we are doing our best? Or even that we are addressing the issue? Talk-ED: O what a glorious thought, Warm-reekin', rich! I travelled south to Dunedin for a family wedding, it was crisply warm, the weather that is, and the whole event was greatly enjoyable. But another thing I look forward to each time I head south is the Otago Daily Times, a newspaper that still keeps its regional flavour and at times can even be inclined to be the parish pump. 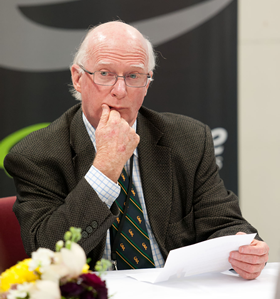 But tucked away in Saturday’s edition was an interesting piece commenting on a discussion at a meeting of the Otago Polytechnic Council. Under a heading of ‘Exciting’ times for polytechs, Chief Executive Phil Ker was reported as leading an exciting brainstorming session clearly stimulated by “lively remarks” he had made. We probably should be giving very serious thought to this idea. Distances in New Zealand are not great and with the growth and development of internet technologies (see below), access takes on a different scale and perspective. The reduction in the number of polytechnics would perhaps even lead to the phrase “distinctive contributions” being thought about in a new way within a “network of provision” that was national. This was the direction started back in the TEAC but as always the recommendations got socialised into the existing framework and the sector by and large carried on. The ODT also reports on the prediction that the sector would become fiercely competitive with the new competition from Asia adding to the presence of what the report calls “a national polytechnic” operating in Dunedin. There are two thrusts here – a national polytechnic and the competition from Asia. We already have examples of quasi-national institutions; Te Wananga o Aotearoa, The Open Polytechnic, Massey University (to a degree so to speak), and at the school level, Te Kura – The Correspondence School. Each reflects a different model and it is hard to be certain just how a national polytechnic might work. It could of course simply be the connection through a new brand of a set of existing polytechnics or it might go the whole hog and be genuinely one institution with one governance body, a single administrative structure and a nationally integrated portfolio of programmes. I know of no such development but deem to see it as a possibility. Asia as a polytechnic competitor is interesting. It seems to me that polytechnic sectors don’t travel too well beyond the level of single programmes. The training approach, the qualification structures, the professional regulatory systems and the differences in labour market needs all conspire to make it difficult to translate technical and applied education from one setting to another. But it is an interesting warning and one made perhaps more credible by the growth of internet technology and its role in tertiary education. There have been predictions about all this for a long time but the indicators do seem to suggest that the momentum in the engagement with on-line learning has started to gather speed. Rate of on-line learning at the tertiary level in the USA is ten times that of the general tertiary growth rate and while the general rate shows flatness (2%), the on-line rate continues to grow (10%). More importantly, it seems to be the trend that says that the on-line / face-to-face issue is not a choice between the two. In the USA, one third of higher education students take an on-line course. And satisfaction rates between the traditional face-to-face and on-line are about the same (see www.sloanconsortium.org). It is reaching the point where institutions that do not pay serious attention to offering on-line learning opportunities even if only to their existing students, will be somewhat left behind . And this is where a national institution, such as that mentioned in the Otago story, could have both a role and an advantage. Ironically, distance becomes an irrelevance in technology-based education. Och aye, there’s some interesting discussions being held in the south about education with more than a mickle and perhaps even a muckle of good sense.